So Binks designed a four, but eventually moved on to make the Binks carbs which are much better known nowadays. 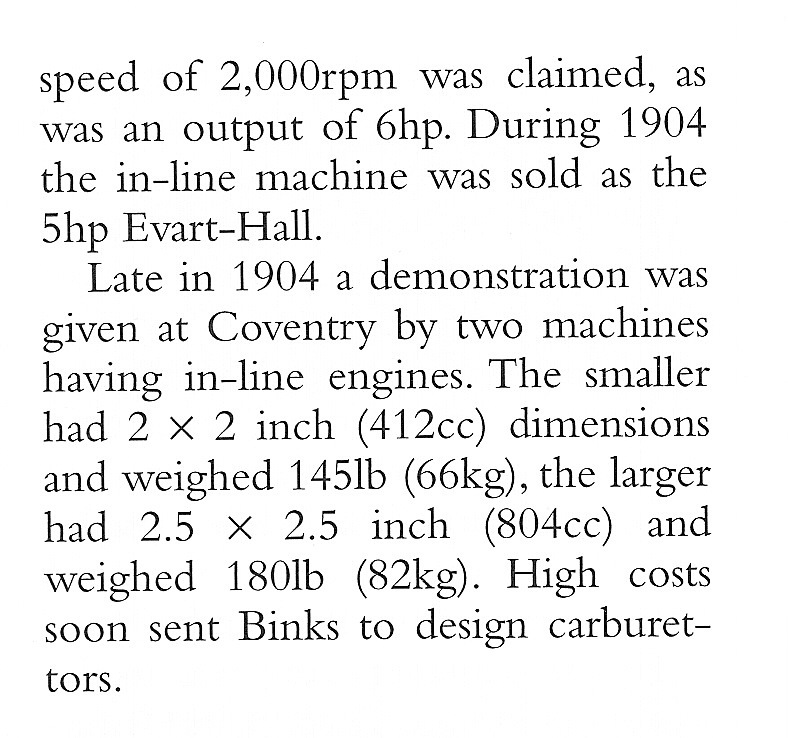 Binks was amalgamated into the AMAL carb company at the same time as Brown & Barlow and AMAC. Sir Max Pemberton wrote a book called The Amateur Motorist in 1907, and it had a very short reference to the Binks, but didn’t provide much info. But he did state a few points about the complexities of a four vs a single. 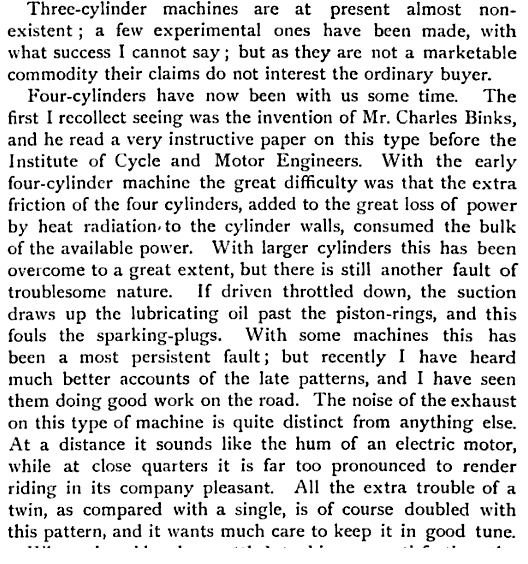 During late 1903 and early 1904 Binks and the writer “Petrolia” wrote letters to the editor of The Motor magazine, back and forth, discussing the merits and disadvantages of a 4 cylinder motor. 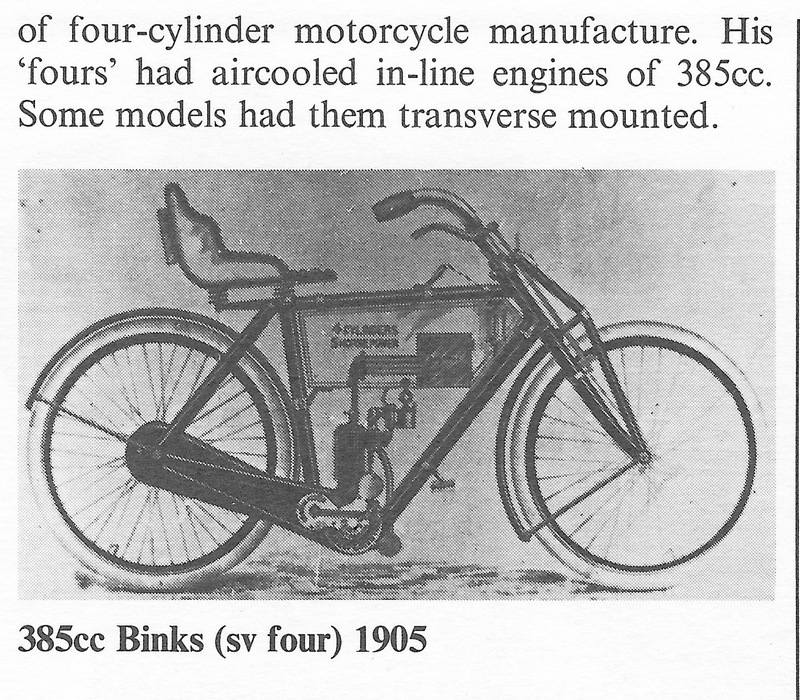 Binks claimed his design had equal cooling to all four cylinders, while Petrolia argued that the front cylinder blocked the cooling air to the rear 3 cylinders. Binks added that his bike was easy to start, Petrolia argued that anybody could start a one cylinder! He added that there were now four times the parts to fail and that he didn’t think a four cylinder design was needed. They were both somewhat correct, but it took a long time for 4s to really catch on. 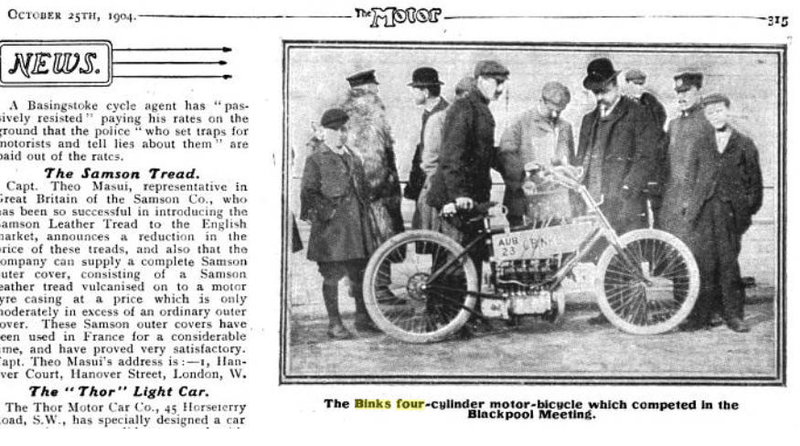 Binks entered one of his bikes in the 1904 races at Blackpool, but didn’t show much speed according to the periodicals. But there is a photo of him and the bike. 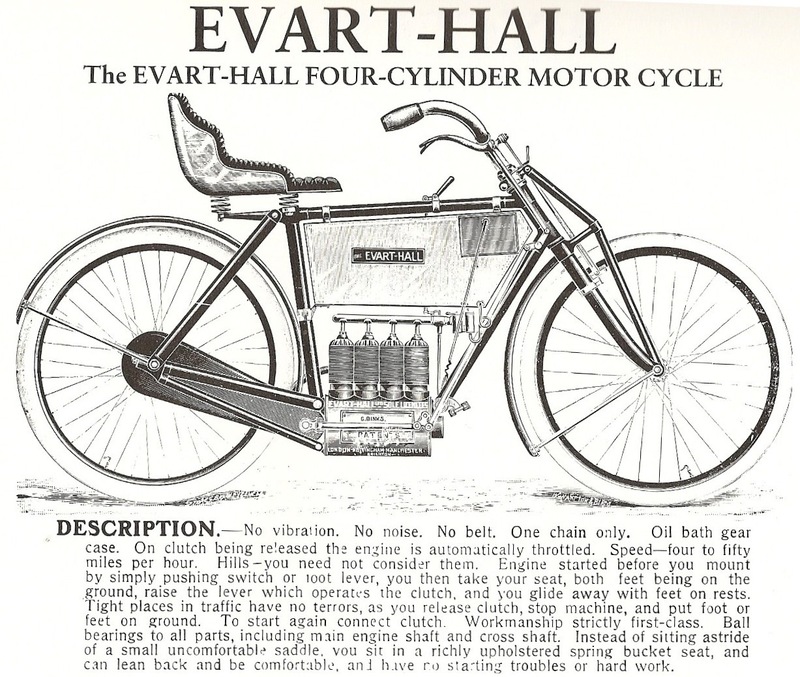 So it was built and ridden, but I haven’t yet found out how many bikes he built, nor how the company Evart-Hall did with his design over the next two years. Could this be the first in line 6 cyl? 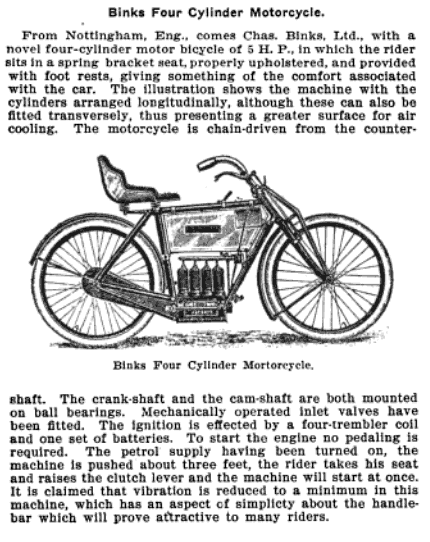 Speaking of early 4 cylinder motorcycles…. There is a guy in his 70’s right now, riding a 1910 four cylinder FN motorcycle from Nepal to Belgium, the home of the FN. You can follow his travels at this website. I have a 1929 FN so I found the site interesting. Good job Pete! I do wonder if the transverse 4 was ever built, but even a prototype counts! I’v done a bit off resurch on a ca 1903 single cilinder Evart Hall. That sounds very likely Geert. We know that they sold the 4cyl Binks re-badged as the E-H. Probably there were a lot of companies like that, wanting to build some bikes, but not being able to design and fabricate 100%, so they bought what they could and sold it as their own.